In the United States of America, insurance fraud is a very serious issue. Every time law makers pass new laws to combat insurance fraud, it seems as though criminals just think of new ways to circumvent them. The issue is becoming increasingly serious in the state of New York, where it appears fraudsters are running rampant. 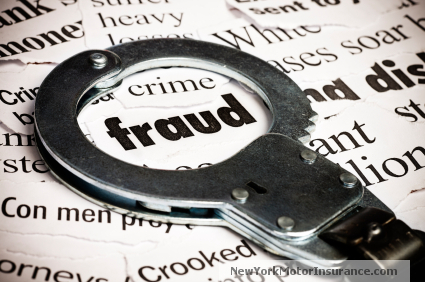 New York, the “insurance fraud capital of the world”, is experiencing somewhat of a fraud-epidemic. Insurance fraud is estimated to cost New York tax payers over $1 billion per year. Jeff Ferguson, an assistant DA in Brooklyn, says that if new measures aren’t taken soon, car insurance may become too expensive for the average New Yorker to afford. Auto insurance fraud is getting so bad in New York that it is forcing law makers to take action. Multi-million dollar insurance fraud schemes seemingly pop up in the newspapers every other day in the state of New York. In fact, according to Mr. Ferguson, around 36% of the insurance claims filed in the state of New York are fraudulent. With more than 1/3 of insurance claims being bogus or inaccurate, it’s no wonder why law makers are describing the situation in New York as “an epidemic”. How does this affect insurance rates? In order to make up for the losses incurred from fraudulent insurance claims, auto insurance providers tend to raise their insurance rates. Because auto insurance companies look at the area you live in when determining your insurance rates, innocent New York drivers are being punished for the high amount of fraudsters in the state. Because of insurance fraud, New York City drivers are faced with some of the highest insurance rates in the nation. In 2009, drivers in Brooklyn paid an average of $2,143 for their annual insurance premium. This is nearly three times higher than the national average of $785 as reported by the National Association of Insurance Commissions (NAIC) for 2009. In attempt to cut down on insurance fraud in New York and to bring New York insurance prices closer to the national average, officials say that new laws are needed. This legislation, however, has proven to be ineffective to date. Fraudsters have been successful in eluding the law and thinking of new ways to “trick” the insurance companies and the police. Much of the fraud in New York appears to involve “runners”, or third party individuals who transport injured car accident victims to hospitals and medical clinics for treatment. Their job is to steer accident victims towards unnecessary (and often expensive) medical treatments, for which the they are compensated. In 2012, following a $279 million fraud scheme exposed by authorities, the New York senate passed new insurance fraud measures which imposed criminal penalties for participating in this type of fraud. Those convicted of being “runners” now face up to 4 years in prison. While the use of runners is on the decline, insurance fraud, however, is not. New fraud methods are being cooked-up and carried-out in the state of New York everyday. How are affordable New York auto insurance rates possible? Until law makers think of new ways to fight fraud, insurance rates will continue to rise in the state of New York. As a consumer, this means that you need to continually search for ways to cut your insurance costs in order to keep it affordable. Check out our guide on lowering insurance costs to get a better idea how you, as a New Yorker, can save some money.